Happy New Year everybody (well most of everyone some still are waiting for it to come). it has been a while since I've posted anything but here I am back again. Hope everybody enjoyed 2017 cause I know I did with CCLP4 and all events that happened to me. Lets give 2018 another good experience and hopefully more Chips Challenge. Today's levelset review is of the custom CC2 levelset "Explorer's Delight 1.2" by H2O. The set contains 6 levels. As the name suggests, the levelset features very large, sprawling levels where exploration is as much a part of the gameplay as the puzzle solving. The full video of my playthrough can be found at the following link: Summary: Overall, I have mixed feelings about this levelset. 1) I absolutely love the idea of focusing on exploration. When I think about what it was like as a kid to play the MS version, I remember more than anything the excitement of discovering new rooms and exploring new passageways. That's one area where I think the official CC2 levelset could have used a lot of improvement, with its focus on small puzzles (often 20x20 or smaller). This levelset does a good job in general of capturing that feel. 2) The puzzle design is top quality. The author consistently puts together puzzles that are interesting, fun, and challenging. 3) The epic reach of the levelset is in some ways its own undoing. Levels 3, 5, and 6 all stand out in my memory as being incredibly frustrating. The problem (of course) is that whenever a level is very long, any late mistake results in the player having to replay the entire level. The challenge for the designer is to find a way to mitigate that. Difficulty by itself is okay, and campaign-length levels by themselves are okay, but when you factor both together you run the risk of player frustration. In my case it took me over 4 hours to beat 6 levels, with the majority of that time spent on the last 2. Granted, I'm not the best CC player, and my dumb mistakes may have contributed to that, but the fact is if this hadn't been a Let's Play, I would have given up. Now, I really do appreciate the attempt to create an exploration-themed set, and I did enjoy my playthrough, although I felt it involved a lot of unnecessary frustration. I personally really liked the first two levels. They both did a great job with the exploration element, and they each had ONE central puzzle. My feeling is that this levelset could be a great success if each level centers around 1, 2, or maybe 3 puzzles at maximum. So, to the author, thank you for uploading! I hope you continue exploring (pun intended) this concept. My personal feel is that large levels should be mostly casual play experiences, and therefore I'd like to see the difficulty dialed down a notch or two. Individual Reviews: 01 ABANDONED MINESHAFT As described, a great intro to the set, love the deco walls/gravel combo. The 'mineshaft' feel was evident with all the broken railroad sections. I loved all the inaccessible areas with extra chips and all the random monsters. The central puzzle with the three blocks was interesting, I didn't know the first time I played it that you could push a dirt block with a directional block. But I liked how there was really nothing else to try. The maze at upper left added a lot to the feel as well. 02 FIERY CAVES A beautiful exploration level with a straightforward concept. My favorite exploration experience of the set. Again, some really cool areas along the sides of the map that you can't quite reach, but they look so cool! 03 SUBTERRANEAN ADVENTURE The first level where the problems inherent with large levels begin to show up. All of the individual puzzles are lovely. I particularly love the opening with the ghost and the great hint. Together, though, the combination just begins to cross the line of frustration. I do like how each puzzle is fully visible before committing, but still, I think the average player will have trouble thinking ahead through the recessed wall and railroad switch portions, and it's a lot of level to replay when you cook it. 04 POWDER MONKEY If FIERY CAVES was my favorite exploration experience, then this is my favorite puzzle experience of the set. All three block puzzles were ingenious and very fun to solve. The difficulty overall was about medium, which is just perfect in my book. I may have busted the west room, since I never opened the red door in the corner. My only critique is that this didn't feel much like an exploration level, and therefore felt out of place in this set. Excellent level however. 05 SCATTERED I think I may have made my peace with this level, despite the frustration exhibited on the Let's Play. One issue that's debatable is: My personal feel is that certain gameplay mechanics are 'bonus' behavior and shouldn't be relied on to solve a level unless help is given either in the form of a hint or else careful level design. Obviously these are up for discussion, but things like monster order, ultra-precise monster timing, block-slapping, or covering up wires are examples of things that are somewhat 'unfair' in my opinion and should be used with caution. This level absolutely tested the limits of my patience, but in retrospect I do think it was kind of cool. It would make a good level towards the end of a difficulty curve, especially if the set containing it already has examples of the previously mentioned gameplay mechanic. The beginning was delightful. 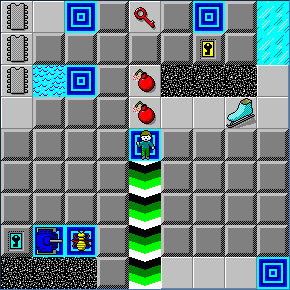 The 'exploration' aspect significantly added to the difficulty, as the inaccessible areas with extra keys made it more confusing. But once explored, it was absolutely a memorable puzzle, with quite a lot of 'how is this even possible' moments and a great, if slightly unfair 'crux'. 06 SMALL OBSTACLES This level, coming after SCATTERED, gave me the most grief of all. Like SUBTERRANEAN ADVENTURE, it's definitely got the exploration theme going for it. And like that level, it has a collection of individually wonderful puzzles which together are just... frustrating. It's a great feeling to solve another section, but when you cook it instead and have to replay everything, it gets old really fast. Additionally, a couple extra factors made this not so fun to play: Also, the later puzzles are HARD. I'm not a particularly good CC player, but I'm pretty sure almost anyone who plays this will mess up the yellow teleport section multiple times and have to replay pretty much the entire level on each go. This adds a lot to the frustration, and makes it more likely the player will make stupid mistakes earlier in the level (a few of which you don't realize until much later). Finally, the last puzzle on bottom left relies on a gameplay mechanic that most people probably haven't tested. In a short level this wouldn't be a deal-breaker, but coming at the end of what was for me a 2+ hour ordeal, it felt pretty unfair to try out something new that might require yet another replay. So, I didn't like this level at all, despite it consisting of some great puzzles. I'd recommend splitting it up into either 2 hard puzzles or, even better, 3 medium puzzles. Hey remember that post? That was a few months ago. So what happened? Well...since I posted that, the only levels I played were in C1059-CC2, with the exception of that collab level I did with Josh, and maybe a few others. Either way, I did not play any other custom sets, nor any CCLP4 voting packs. And unfortunately, it feels good. CC is a good game, there's a reason why it's still popular over 25 years after it was first released. But honestly, now that I stopped playing, I can't say I miss it. I think that my life has actually been improving since then. Not playing CC anymore gives me more time to focus on things that I find more important. So essentially, I'm leaving CCZone. This time it's for real. It was good while it lasted, but now it's over. I released an update to C1059-CC2 yesterday; I reached my 149-level goal, nearly all levels have replays, and they shouldn't contain any major busts. If I ever update it again, it will take a while. Also, some of you may have noticed how I uploaded a bunch of videos on Youtube on Christmas Eve. These videos were filmed a while ago, I just didn't upload them. Now that everything I filmed has been uploaded, I won't be uploading anything else for a while. If anyone wants to continue my LPs where I left off, feel free to do so. TCCLPRejects Jacques.dat LizzyB1 I may visit this site again sometimes, but don't count on much. I may come back for CCLP4, but I won't guarantee anything. If anyone needs to contact me, please email me: myusername at gmail dot com (of course, replace myusername with my username). I have one last request. Please consider C1059-CCLP4 for all future official CC1 sets, and C1059-CC2 for all future CC2 sets. Tyler will have to give his consent for 110 to be submitted, and Josh, for level 147. I don't have anything else to say, so just goodbye. Thank you for being a part of my life for the past three years or so. Be positive and amazing. I've been wanting to make a post about this for a long time. Here are my thoughts on the subject. MS is perhaps my least favourite ruleset, because it's just so full of glitches. Like you, I especially hate slide delay. Boosting can also be a pain in some levels. Perhaps the only levels I prefer in MS are so called "insane levels". When I first started playing in Lynx, I was absolutely annoyed at the animations, although I got used to them and now I like them. Perhaps the only problem I find with it is splash delay, and explosion delay. So Steam is probably my favourite ruleset. It's also got wall slapping, which makes blue wall levels a whole lot less frustrating, and shorter animations. Also, CC2 supports some tile combinations that were invalid in Lynx, such as objects on locks or water, which gives the designer more freedom without having to worry about ruleset compatibility. There are a few annoying things with CC2, such as the recently discovered force floor bug (it completely ruined one of my level ideas) and I find block slapping harder than in Tile World, but overall I think it's better. Thank you for posting this. As someone who rejoined the community shortly before the release of CCLP1 and played through it in its entirety the day after release, I guess I'll offer some counterpoints. As a result, I didn't really have any CCLP1 hype other than it was another community set with, presumably, some of the most fun levels out there. And to me, it was, and created its own hype! "I was hungry for a new puzzle game" I think this is the root of the issue. CCLP1 didn't set out to be brutally difficult with its puzzles, it set out to be a fitting introduction. Going in expecting to be stumped repeatedly was a setup for disappointment: a valid reason, sure, but if you wanted high solving difficulty the end of 60 Minutes or most of thinker's levels fit the bill. "(as opposed to the awful, buggy and somehow popular 5fps port)" I can see where the complaints come from but I like the discreteness of each move: I think it works well for a puzzle game. "CCLP1 presents a medley of about 80 levels which were all designed for the level 15 slot. No individual level was actually bad, however by level 100 I noticed that the set I was playing through hadn't reached Tossed Salad difficulty yet." Looking through the set, I wouldn't say the difficulty curve is quite that gentle, but it's definitely more gentle than it needs to be. The first somewhat tricky level comes halfway through at Funfair (which isn't to say there's nothing tricky before this, but they're more on the small scale. I got stuck at Double Diversion for much longer than I should have). Mughfe is definitely past Tossed Salad in difficulty, however, and I think if that's where the curve started picking up the difficulty issue wouldn't be one. I'd even put Chip Suey at around equivalent, and it's in the same slot! "I remembered back to the strategic dodging on Digger and Blobdance; the creative puzzles Four Square and Catacombs; and Blobdance and On The Rocks, which dared to be difficult. Due to an excessive focus on beginner-friendliness and "fair" design (can it be beaten it in 1 try), CCLP1 is simply boring." Given Blobdance being there twice, I assume that you meant Blobnet the second time. Digger has a counterpart in Dig and Dig which is far simpler, and I'll acknowledge it's inferior. Blobdance -> Blobs on a Plane, and Blobdance made the mistake of going too far. Blobnet and On the Rocks are some of the worst points in CC1's difficulty curve (along with Nuts and Bolts: a trial by fire is not a good introduction), so though they dared to be difficult, I'm not convinced that's a good thing, especially as their difficulty comes from tedium and inexperience.Four Square and Catacombs have no direct comparisons, but CCLP1 has quite a few creative concepts executed very well that to me, despite the easier difficulty, kept my interest throughout. "After the early-game snoozefest, however, the set becomes a lot better, and I enjoyed most of the triple digit levels. If only the set had reached this point sooner, and I see no reason why it didn't" Honestly, it kind of did! I'd say the that point stops at Colors for Extreme, and though there are a fair amount of breather levels interspersed throughout, it kept a variety of gameplay that CCLP3 lacked near the end. And I loved solving CCLP3! "One thing's for sure: if I ever play that Chips Challenge set, it's because I want a challenge. Something with a difficulty peak that puts CCLP3 to shame." There's not enough difficult levels out there for CCLP4 to surpass or even reach CCLP3's difficulty peak..but CCLP4 will probably end up a step above CCLP2 on the scale. "in the decade before it gets released." Decade? Have you no faith in the CCLP4 staff? I can't imagine CCLP4's release date coming later than the end of 2017 at this point. In closing... "I know I'm being harsh. But this is just how I personally felt about the set." And that's totally fair and I can see where some of your points come from, and they're definitely valid points in some cases. But I think there's some dissonance with actual and percieved difficulty of CC1/CCLP1 levels, along with expecting tougher levels than were presented giving a more jaded outlook on the set. Taking CCLP1 entirely as a puzzle, it's not very good. As a game, it's a ton of fun and had a lot of fresh concepts. As a puzzle game? Well, it tends more towards game than puzzle, but after all: so did CC1.